A 79-YEAR-OLD man from Matshobana suburb in Bulawayo allegedly committed suicide by throwing himself in front of a moving train following a dispute with his 54-year-old son. Manonoka Mponda was on Monday afternoon found dead along the Bulawayo-Victoria Falls railway line near Matshobana suburb. Mponda’s tragic death comes four months after his grandson fatally stabbed his uncle with a kitchen knife following a dispute revolving around a protection order granted against him. In December, Desmond Phiri stabbed his uncle Jonathan Phiri (39) after he tried to restrain him from violating a protection order barring him from visiting his grandfather’s home. Mponda’s daughter, Ms Norah Phiri, whose son fatally stabbed his uncle in December, yesterday said her father wrote a short suicide note and gave it to her son to deliver to her. “My son brought a letter from my father. Initially I didn’t think it was urgent but when I opened it I got worried as it was saying “sengihamba alisangiboni futhi” (I’m leaving and you won’t see me again,” said Ms Phiri, who resides in neighbouring Mpopoma suburb. She said she panicked and informed one of her brothers and they rushed home to find out what their father meant. Ms Phiri said Mponda was missing and the children told them that it had been a while since they last saw him. “We started searching for him and we heard that an old man had been found dead near the railway line across the road. We rushed to the scene where several people were already gathered. We positively identified him although he was badly injured on the face and leg. He was bleeding through the nose and mouth,” she said. Ms Phiri said she did not expect Mponda to commit suicide, although she knew that he was troubled. She said the elderly man was having a dispute with one of his sons aged 54. “Although I do not know what really happened, I think he had a misunderstanding with my brother. They lived together here at home. I couldn’t ask him (her father) what was troubling him but he was definitely not himself of late. We also avoided asking my brother what could have happened as tension is still too high. But we will ask him when things settle down,” Ms Phiri said. She said her father’s death cannot be linked to the incident where her son fatally stabbed his uncle. 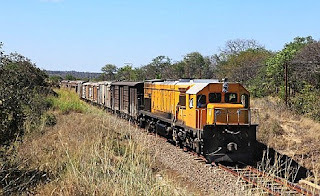 National Railways of Zimbabwe (NRZ) Public Relations Manager Mr Nyasha Maravanyika confirmed that Mponda threw himself in front of a moving train near the depot in Mpopoma. “The train driver said the man threw himself in front of a moving train and died on the spot. It’s a suspected suicide,” said Mr Maravanyika. He urged members of the public to desist from throwing themselves onto railway infrastructure.